Frescoe showing Guru Hargobind receiving two horses from Bhai Bidhi Chand. Dr Madanjit Kaur highlights the destruction of Sikh heritage at Sri Akal Takht Sahib. When we reached near Sri Akal Takht Sahib, we were shattered to see that all specimens of Sikh and Hindu art had been lost for posterity with the destruction of the old building. Sikh and Hindu artists hired from hill states had created these works under the patronage of Sikh Sardars and Maharaja Ranjit Singh in the late 18th and early 19th centuries. The building had been opened only after the central government had hastily got repaired the building on contract. 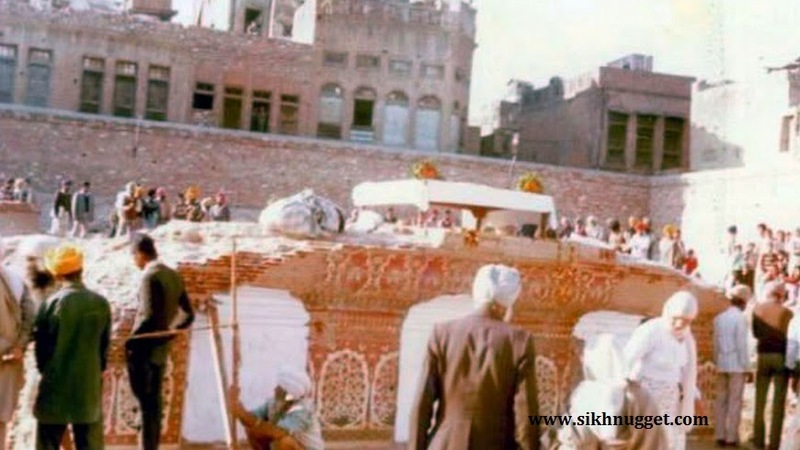 However, the Sikh community rejected the gesture.As soon as the Shiromani Gurdwara Parbandhak Committee (SGPC) was given charge, the Sangat started demolishing it. When we saw big hammers hitting the murals, I pleaded with them to stop in the name of God. They refused to listen, saying they would cover walls with smooth plaster. With that demolition, the murals, gold work, woodwork, mahrakashi, wall paintings, gach work, jaratkari and tukri work, calligraphy, were all lost to history. They could not be restored on account of non-availability of artisans skilled in the original art and natural colours used earlier in the market. The destruction of the old art work in the building of Sri Akal Takht Sahib on account of Operation Blue Star has been a great historical loss of the cultural heritage of Sikhs in particular and the art of northern India in general. 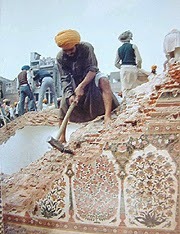 Artwork destroyed as part of rebuilding Sri Akal Takht. 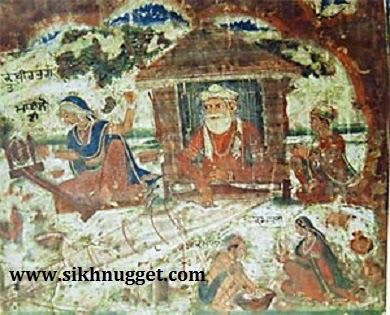 There was a mural in a small room in the north on the second storey of Akal Takht Sahib. It contained specimens of Sikh wall paintings, the most prominent of them being two depictions of Guru Hargobind Sahib, the sixth Sikh guru. 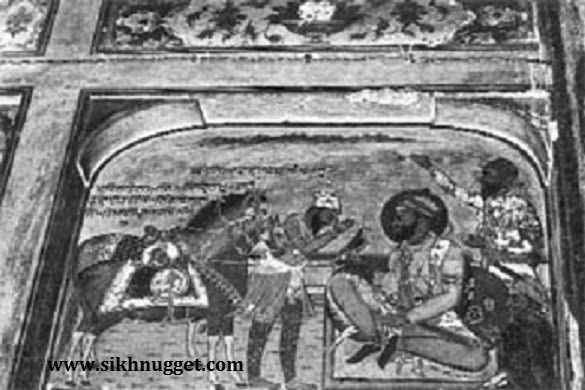 One mural depicted Guru Hargobind with his five sons. 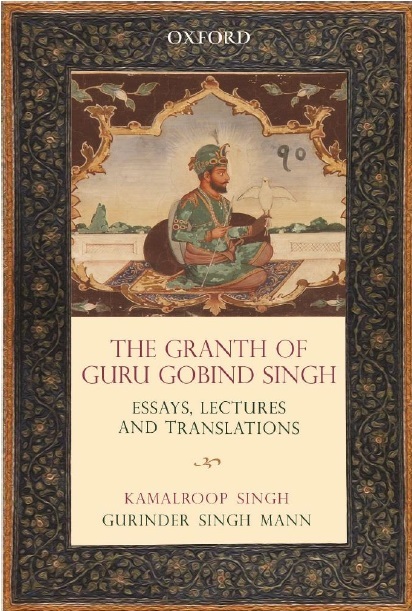 It was an impressive picture: Robust figure of Guru Hargobind sitting with a hawk on his hand and a sword in another, two attendants behind him. The painting was a documentary evidence of the warrior-guru. Yet another mural depicted Guru Hargobind Sahib receiving Bhai Biddi Chand presenting two horses to him.There were numerous murals on the ceilings, some depicting themes of Hindu mythology, representing Lord Krishna, Radha and the gopis in a circle. Floral designs with motifs were painted on the panels of the Takht. As someone who grew up documenting this tangible history, I could feel the pain of centuries of history being reduced to debris. Fresco depicting Bhagat Kabir weaving at his traditional 'khaddi' and Mai Loi spinning. The picture that once adored the walls of Akal Takht was destroyed when its building was pulled down.